Thank you for this HARRY POTTER WAND!! I am brand new to 3D printing but am learning, because our school has an awesome MakerSpace for allowing students to be creative with cool new technology. The first time I tried to print this, I did so without supports (because I didn't know what those were), and it turned out terribly. If at first you don't succeed, try try again. I quickly learned how to use supports, and it turned out great! I used a cool [caution: technical terms ahead] brownish-blackish sparkly filament, and it looks so cool. Thank you very much for posting this! I'll post a picture as soon as I can! I've printed 2 of these on my Prusa i3 MK2S in the eSun wood PLA and in Inland Luminous (my son wanted one in glow in the dark lol) but for some reason the pieces do not want to join. It's almost as if the tip piece doesn't have a long enough connector. Anyone have any thoughts/ideas? I know that's a terrible explanation, but hopefully it helps a little. 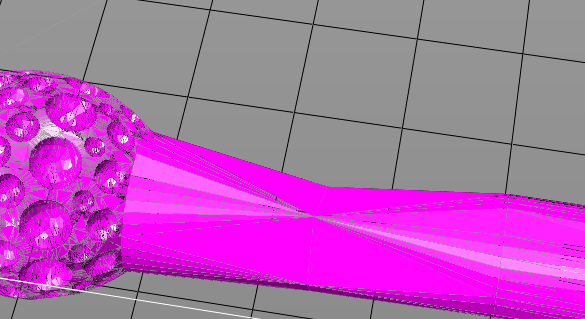 You should use supports if printing horizontally. I think some have had success support-less in the vertical orientation, but it is a risk. You can try. I printed the two components separately, and did so horizontally. But I think some have printed vertically. Any way to add a screw/hole connector to join the two pieces? not with a core like the remixed version, but just replacing the funny little sharp cone insert with an actual screw and the hold in the bottom half of the wand. current set up is not very secure, requires bracing while glueing to ensure it dries completely straight. i'd do it if i had the know how, sigh. How long is each part of the wand? I have a small printer and need to know if it will work. As long as you don't scale it, it is 15" as is. My FlashForge Creator Pro, on Medium (200 micron) settings with PLA claims it should take a little over three hours. We'll see! This would be awesome printed in wood PLA filament. I'll have to do one see how it turns out. I agree, please post some pictures once you have printed it. I have some nice Hatchbox wood PLA, just waiting on the coated nozzles to print! Ok so I know it says non-commercial but I have a ton of people at school who what to buy one of these from me. If I do it at my school only (I will not try to sell it online or anywhere else) can I sell it? I would be ok with that, but it is best to only charge for materials and your time used. If you feel bad, you can always leave a tip, haha. Is there any way you could make this into a 15 inch wand to match the books? When I made it, it came out to 11 inches. It is 15" long in the CAD. Make sure you are not scaling it to fit the print bed. That is why I originally had it as two separate pieces in order to fit properly on a MakerBot 5th Gen printer. wow how did model that in solidworks! thats crazy, do you have a video about the process? Sorry, I don't have the video. It was primarily done using splines and revolves, as well as linear and revolved patterning. Glad you like it. What software did you use to design this? It was designed using SolidWorks I believe. The primary wand shaft is a revolve, while the holes are a combination of revolved cuts and circular patterns. would it be possible to get the SolidWorks file from you? Thank you for the reminder, I have been meaning to post that in case people wanted to scale it or remix it. I have access to large scale industrial printers and can easily make it actual size. Even better. I would like to see the print once you have finished, if you wouldn't mind posting it as 'made'.